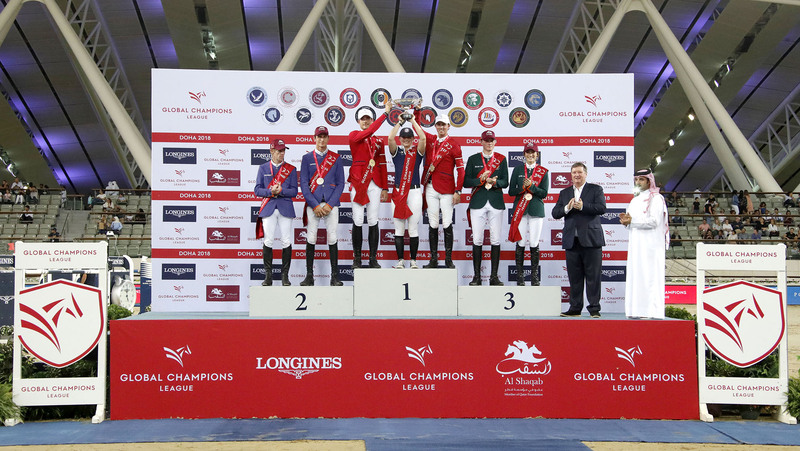 The stand out combination of the season Ben Maher and Explosion W along with team mate Nicola Philippaerts and H&M Chilli Willi faced down ferocious pressure and rode perfect clear rounds to win both the GLC final leg in Doha and the overall GCL team championship. New York Empire had a mountain to climb but achieved an amazing result to lift them into 16th place to qualify for the Playoffs. But three teams - Chantilly Pegasus, Cascais Charms and Hamburg Giants - were not so fortunate and ended up in the drop zone. Teams paraded before the final lead into the arena by aspiring young riders from the AL SHAQAB Riding Academy waving the flags of the teams with their signature logos. The big team showdown got underway in a sunny 28°C with a welcome breeze and viewers on TV and GCTV live streaming were treated to stunning views of the soaring infrastructure of the venue and to the Doha city skyscrapers in the distance. Uliano Vezzani set a time allowed of 76 seconds for the course in the 120m x 80m sand arena so there was no room for error. Although poles fell at multiple fences it was the treble combination that was utterly devilish upsetting plenty of team scores. Scores from the GCL Round 1 were carried forward and teams started in reverse order with London Knights in the privileged position of going last thanks to their first round clears. Ali Al Rumaihi, Event Director of AL SHAQAB: "As one of only 16 cities in the world [on the Championship], we are very honoured and privileged to be given the opportunity to host this event in Qatar and Al Shaqab. The GCL is an extraordinary sporting event. It takes a lot of effort and being chosen as one of the venues for this competition only goes to show our ability to host and organize world class events." Jan Tops, Co-Founder GCL: “We are really building tradition as you can see at this event. Today when the crowd came out, and if I see how we started 7 or 8 years ago here with the Federation it’s a big improvement. It’s a fantastic atmosphere for the riders and great to have so many people here for the final in Qatar. It was a nice story for London Knights to win the Championship and very well deserved. "Valkenswaard United has been for three years near the top - this year I will say they were stronger - and Miami Celtics had a good team so they came back from fifth place to the third. The Rome Gladiators are now in 4th place and have automatically qualified for the semi-finals, they just snuck in front of the Shanghai Swans. I think a lot of things happened this weekend and you know we’ll be super excited for the Playoffs. "We have sixteen events, and now sixteen teams who are going to the Playoffs. It was fantastic to see the New York Empire back in the race and the good concept [behind the Playoffs] is everybody has a chance to win the big prize pot." Nicola Philippaerts, London Knights, 2018 GCL Winners: “It’s been an amazing season and for Ben and I to have four wins together is unbelievable. I think all five riders did enough and all five of us deserve to win this season so it’s amazing to take the trophy home. Like Marcus said, every class counts so there’s always a bit of pressure and you need to stay focused - you need to fight for every single round and I think we did that very well this year." Marcus Ehning, Valkenswaard United: "I must say it was a really good season for us. We did everything but the last two stages we lost a bit - but we are also happy with the second place. At every stage you have to be really concentrate from the first class, they are really big classes where you have to give your best with your best horses and we also look forward to the Playoffs. We have five really good riders first of all and the relationship between us is very good. I think we are friends and it’s a good partnership and that’s also positive." Michael Duffy, Miami Celtics: "It’s been a really rollercoaster year to come to these shows with the atmosphere and tradition that the Longines Global Champions Tour holds is phenomenal. We are a newly formed team so to be on the podium I think is a good achievement. "We’ve had our ups and downs, we started with a couple of really not so good results, I came here with a couple of green horses so we were with our backs to the wall a bit. The Rome Gladiators and Shanghai Swans were jumping at the bit and on our heels so we had to try and get it done and thankfully we did. Yeah we finished well and hopefully that will be a good marker for GC Playoffs."